In 2003, Pixar animation delighted us with its classic fish tale, Finding Nemo. Nemo introduced the world to a blue tang fish with short term memory loss named Dory, voiced by Ellen DeGeneres. 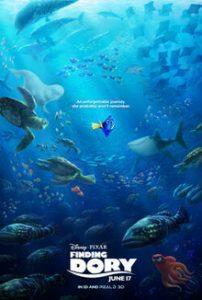 Thirteen years later, Pixar (now part of Disney), along with writer-director Andrew Stanton, gives us a new animated classic, Finding Dory, with Dory in the central role. In the current outing, Dory becomes separated from her parents, and must find her way home. Her short term memory loss makes her predicament even more difficult. But Dory is persistent, if nothing else. She uses her winning personality, sense of humor, and her inquisitive nature to get closer and closer to home. Along the way, she meets up with Nemo and his father Marlin (voiced by Albert Brooks) from the original movie, to assist her on her quest. In addition, Dory enlists the help of other new friends, including a cranky octopus named Hank, to help find her way home. Finding Dory is that rarity in movies, even among animated films. It appeals to every age group, from young children to parents and grandparents. The animation is up to the high Pixar standards we’ve come to expect, from Toy Story to last year’s Inside Out. The colorful underwater adventure is a visual treat for all ages. Much of the movie takes place in a marine park, with various tanks and exhibits, full of activity above and below water. The voice of Sigourney Weaver comes across the PA system frequently with announcements, and becomes a long running joke after a while. There is humor on many levels, but the movie is blessed free from much of the crude humor that has found itself into many children’s movies over the last decade. Finding Dory is blessed with a very rare gentle spirit in movies today. The story is quite simple, but, as with the best children’s stories, speaks to adults as well as children. At the beginning, Dory has little faith in herself, knowing only that she can’t remember even the simplest things. Yet, her self-confidence grows within the movie, as she learns that there are things she can do. By the end of the movie, Dory begins to ask herself “What would Dory do?” She is able to remember certain visual clues along the way that help her to find her way home. Decades after the classic The Wizard of Oz, Dory is a contemporary Dorothy. Like Dorothy, she makes friends along her journey, and builds relationships with them, forming community. Toward the end of the movie, even after she finds her parents, Dory returns to find two friends and bring them home with her. Each one helps the other along the way. Parents can rest assured that Finding Dory doesn’t have the scary scenes with witches and flying monkeys, but, as any child knows, being lost is still pretty scary in its own right. My only complaint with Finding Dory is that, even at 100 minutes, it seems a little long. Twice in the last ten minutes of the movie, I thought it was over, but it continued. As Finding Nemo became a big hit 13 years ago, Finding Dory is on its way to becoming a big hit today. It’s an entertaining summer treat, with life lessons for all. It may be especially meaningful to children with disabilities, along with their parents. Dory begins by being apologetic about her disability. However her journey teaches her that, despite her disability, she has what she needs to find her way home, with a little help from her friends.